You probably think the title of this article is a come-on. That there’s no way this post could actually be about a meatball, or perhaps you think that it may include a meatball, but only tangentially. Well… you’re wrong. 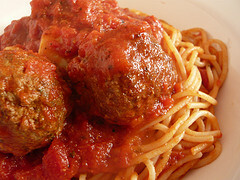 This article IS about a meatball. A small, dense meatball covered in thick red gravy. One that I ate (or tried to eat) many years ago. A meatball that will be forever ingrained in my memory as The Meatball of Fundraising Truth. Almost ten years ago, to be exact. I was a (relatively) young man, and for the first time, I was heading up a large fundraising organization. I had a staff, a large development budget and the freedom to create and implement fundraising strategy, largely without any other oversight. I was meeting with an important fundraising prospect. An older man, in his mid-70s, who wore expensive, perfectly tailored suits, crisp white shirts and loved pocket squares. He also had a penchant for Italian food. He suggested we meet for lunch at a well-known and expensive Italian restaurant in Philadelphia. I had met him several times prior, and he had a real passion for our cause. He had gotten mildly involved by introducing me to several other prospects, and I had decided that this was the right time for an ask. A very big ask. I wasn’t nervous about the ask, but I did feel out of my league dealing with this gentleman. So, I put on “the Persona.” You know the one… I put on my game face. Stiff, professional, slightly impersonal. I imagined that I was being businesslike and that this persona would appeal to my very professional and “together” prospect. Halfway into our lunch, things weren’t going anywhere fast. The conversation was stilted, there was lots of quiet and I spent most of the time thinking about things to say just to fill the empty space. Now, I don’t normally order pasta at donor meals. It’s too messy, and I spend the entire time worrying that I will get sauce on my tie. But at this restaurant, there wasn’t really any other option. Pasta with red gravy, pasty with cream sauce… pasta, pasta, pasta. When you’re in South Philly, you order pasta. So as I sat there, halfway through our meeting, I had a half-plate of pasta and two small meatballs left in front of me. I plunged my fork into one of the remaining meatballs, and used it to sop up some sauce. Just then, a waiter walking directly behind me dropped a plate. It crashed into the tiled floor with a loud crack and burst into pieces. I quickly turned, startled by the noise. As I did, I unconsciously swung my hand out, the hand with the fork and meatball in it. The small meatball turned into a sauce-encased projectile, flying off the fork. I turned back around in time to see the meatball roll down my dignified prospect’s crisp white shirt, over his bright red tie, and come to rest in his lap. Before I could gather myself enough to apologize, both for ruining the donor’s clothes and for my inane comment, the prospect started to laugh. Hysterically. The waiter came over and apologized. My lunch guest spent 5 minutes explaining what a good shot I was. We laughed some more. I offered to pay for his dry-cleaning. He offered to pay for another meatball, to replace the one I had launched at him. We lingered over dessert and coffee, and he recounted stories from his childhood about food fights with his brothers when his mother wasn’t looking. We were relaxed, and the conversation flowed. I made the ask before we finished. He didn’t hesitate to say yes to making a large gift. Once that meatball hit his shirt, everything changed. Because that incident – the dropped plate, the meatball rolling down a crisp white shirt – forced me to let my guard down. I stopped putting on the “persona” and started being myself. We conversed as real people, and we built a relationship, rather than just being focused on a transaction. And it resulted in a major donation for the organization. To this day, when I am working on making a major ask, I think about that day, ten years ago, in an Italian restaurant in South Philadelphia. It reminds me to be authentic, and to be myself. Prospects and donors want to deal with real people, not personas. They want to develop strong bonds with the organizations they are supporting and the people who work there. They want to invest in real people doing real good in the world. And I learned all of that from one sauce-covered meatball. Bullseye! Or more like you “really hit the nail on its head” w this great story about authenticity! BRAVO! Thanks for sharing! Thanks Sheila, glad you enjoyed it! Out of all your posts, I started with this one, and I am so glad I did. Who can resist a meatball? Except maybe a vegetarian. I am finding the older I get, I can’t seem to be anything but who I really am. Good for you, Joe, you got a head start on authenticity. A story that seemed like it couldn’t possibly end well was wonderfully charming and funny. Thanks Dawn! Glad you liked it!